We've been lounging at the Wyndham Grand Rio Mar Beach Resort this week. Tomorrow we check out and will spend a couple days in San Juan. I completed a timeshare shop, which reimbursed all my travel expenses, and have another hotel to shop in San Juan. Once again, mystery shopping has provided us with a nearly free vacation. We spent three hours at the timeshare presentation, but the rest of our time at this resort is ours to do whatever we'd like. The other hotel I am shopping is a limited-service brand, so the observations are minimal. Our only out of pocket expenses are for food, gasoline and any recreational activities. Puerto Rico is great. In the tourist areas - the hotels, airport, car rental place, and rainforest, we've been able to communicate in English. Even some of the restaurant employees know English, but so far none of the fast food workers have known English. I spoke with our bartender last night and learned that only minimal English is taught in public schools here. Kids in private schools learn it though. 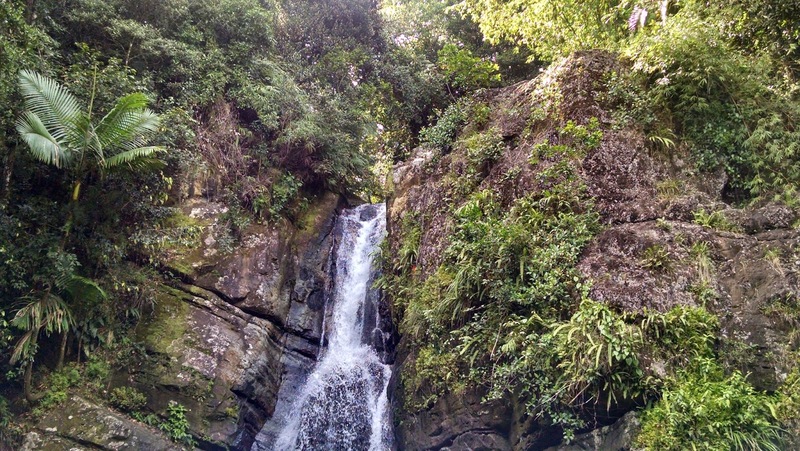 We've visited the rainforest (El Yunque) both of the last two days and have hiked a few trails. This morning we walked the beach for nature's pedicure. We visited a local bakery, tried mofongo at another restaurant, and walked through the local supermarket to see how things are different here. Tomorrow we will get to visit San Juan, which is much larger than I ever imagined. There's over two million people in the area, if that gives you an idea. My goal is to find a great, cheap cup of Puerto Rican coffee before we leave. If the price is right, we may even take a bag of it home with us.